Last week, I featured Bank of America’s BankAmericard Cash Rewards credit card, compiling most relevant information that is more or less public, meaning that you can obtain the information without actually having the card. As an actual cardholder, I have the advantage of knowing exactly what’s inside Bank of America’s online banking system, what other benefits a BofA card offers, as well as the details of the card’s features. I really like the layout of the site. 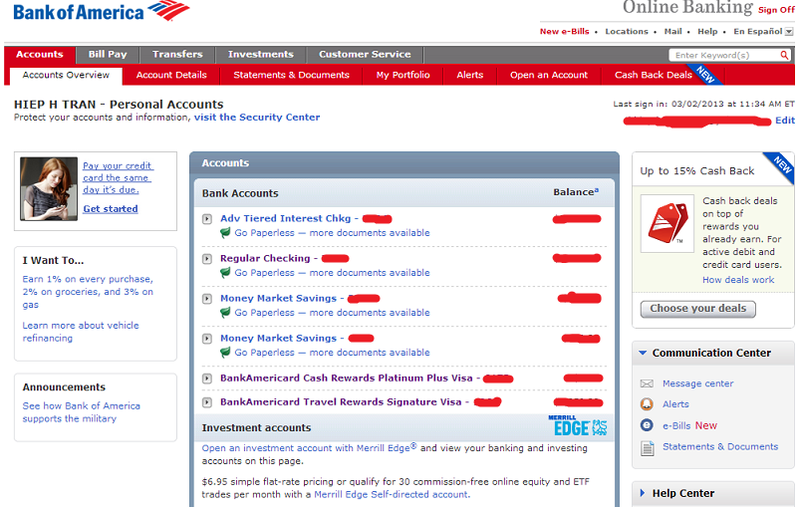 Bank of America was voted the best for online banking in 2012 . I think they deserve this merit. BofA implemented very well the tabbed document interface that was FireFox’s most lethal weapon against Internet Explorer back in the days. The summary of accounts is well-organized and clearly-displayed on the main page. The essential information is easily found in the drop down list. The Communication Center is conveniently put on the right hand side of the main page for easy access to customer service. 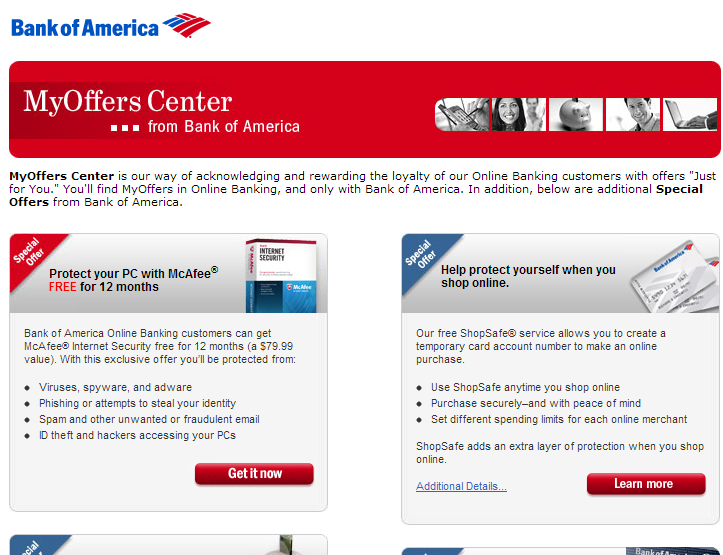 Right above this is a shortcut to BankAmeriDeals, a benefit to BofA cardholders that I will cover later in this post. With such a user-friendly interface, there is no doubt that Bank of America should be ranked No.1 in online banking customer experience. For each credit card transaction greater than a dollar, you will get some cashback reward. 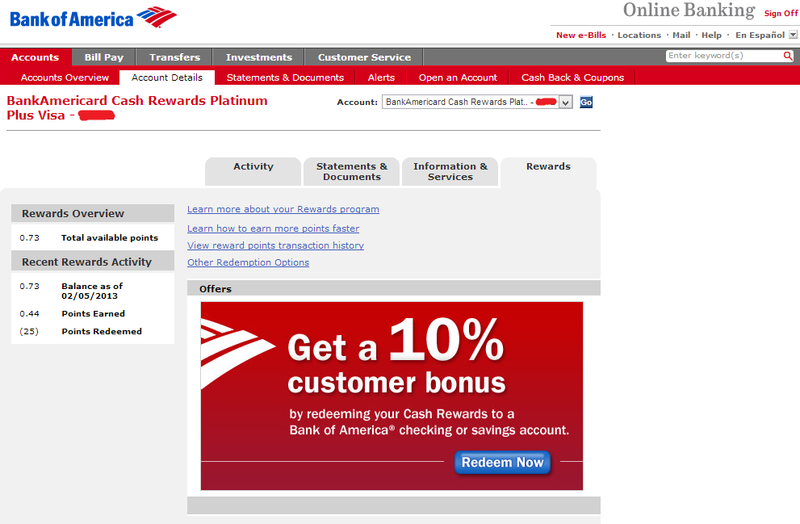 Bank of America does a good job of itemizing cashback earnings: they tell you how much cashback each transaction earned. 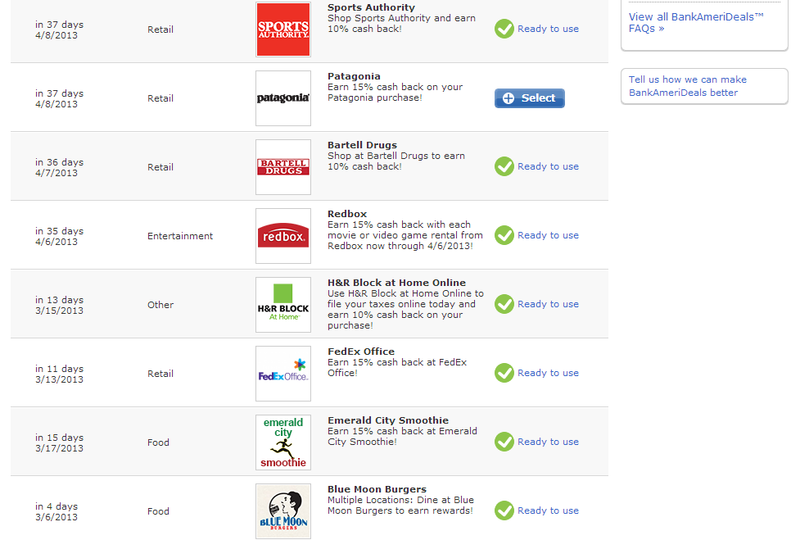 Looking at the list, I noticed that Bank of America rounds down each cashback earning to the cent. As you can see below, a $32.84 earned me 32 cents instead of 33 cents if they used regular rounding conventions: 1% of 32.84 dollars is 32.84 cents, which should be rounded to 33 cents. So even though the nominal cashback earning rate is 1.1%, 2.2%, or 3.3% depending on the category of spending, due to the rounding formula, the actual rate is a little smaller. There’s another caveat to their cashback program: you need to redeem at least $25 at a time; if you have accumulated less than $25 you will not be able to redeem the cashback. Therefore, you should redeem cashback in multiples of $25. For example, say I have $49 in cashback. I will redeem $25, leaving $24 unredeemed. Then I’ll need another $1 in cashback to redeem everything. 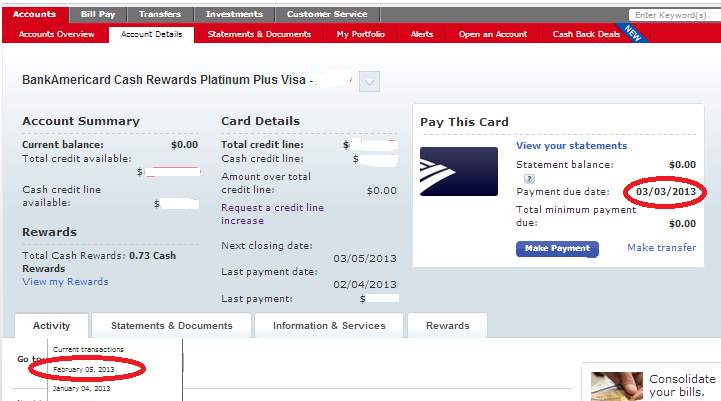 On the other hand, if I redeemed $40 leaving $9, I’d need to earn another $16 in cashback for the next redemption. On the plus side, if you deposit your cashback into your BofA banking account, it will post immediately – the transaction is considered an internal transfer and is a lot faster than a check deposit. Bank of America allows at least 25 days to pay the minimum required amount. This is a very generous policy: you essentially borrow money without interest for 25 days. I usually pay off the balance right after the statement cuts, but it’s great to know that if I ever find myself having to borrow money, I will have at least 25 days to pay it back without interest. If I time the borrowing right, I’ll have a month + 25 days: borrow on the first day of a statement cycle, and I’ll be interest-fee until 25 days after the last day of the statement cycle. Of course I do not advocate borrowing from your credit card, but in case of an emergency, having this money immediately available will be very helpful. If my lovely house in Seattle is destroyed by a dinosaur from Jurassic Park, I will need money immediately for the repair. I will fund the repair with my credit cards initially while looking for a bank loan. As long as I can secure a loan before the 25-day threshold, or up to 56-day depending on the timing, I will pay off the balances and not pay Bank of America a single penny in interest. Another lovely payment policy of Bank of America is the no-limit on balance payments. You can make multiple payments during a statement cycle, and you can pay above the current balance; the excess payment will become a statement credit. Some other banks allow only 1 payment each cycle, or will not let you pay more than the balance posted in the most recent statement. Amex is one example for the former case, and Chase one for the latter. This feature allows you to pre-pay your balance and never have to worry about missing a payment. I find the feature especially helpful for two reasons. First, to maximize my credit score, I need zero reported balances on most of my cards, so I want to pay off the balance before the statement cuts. 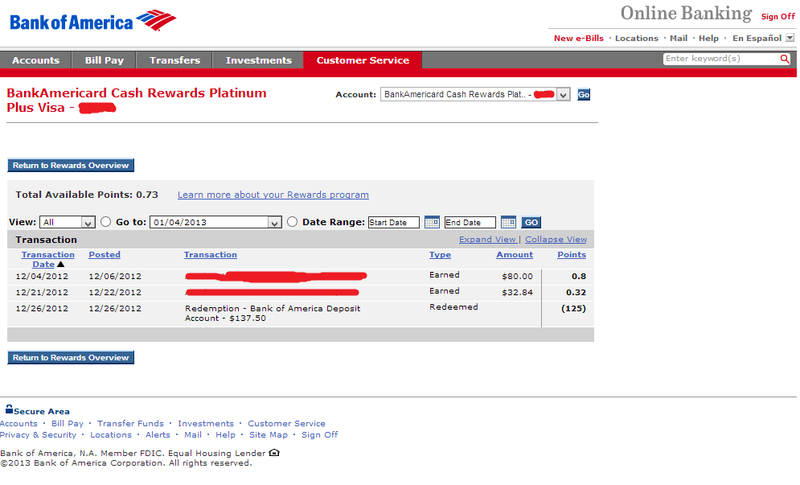 With Bank of America, I can pay off the balance any time; no waiting necessary. Secondly, for some of my cards, I put a small payment on each of them once every few months so that they stay active. I would pre-pay all the payments months at a time, so that the balance will always be 0 and will be reported as such. 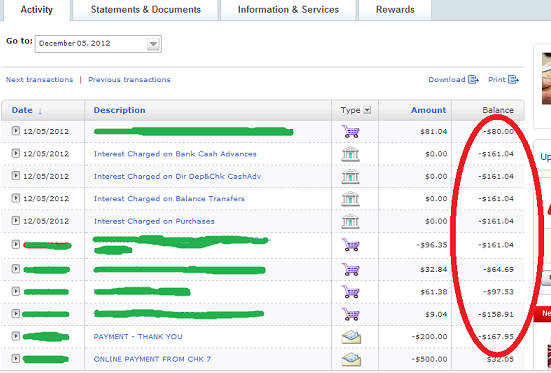 This is how I have managed to obtain so many wonderful credit cards with just over a year of credit history. 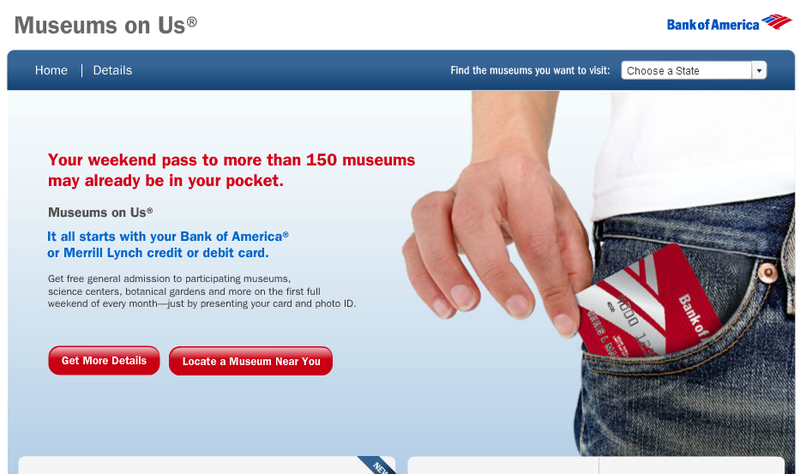 Completely straightforward: as a BofA debit or credit card holder, you’re entitled to one free general admission to more than 150 museums nationwide on the first full weekend of each month. Some notable museums include the Guggenheim in NYC and the Museum of Fine Arts in Boston. I’ve tried this function on the Seattle Art Museum. Showed the receptionist my BofA card, and she gave me a free ticket. Very easy. Next up is BofA’s Special Offers. My special offers include 12 months of free McAfee Antivirus and a .25% discount on auto loan in case of a refinance. Nothing useful for me, but you may have other offers that are more lucrative. BankAmeriDeals offers cashback deals customized for your geographical location. At any time there is a number of their partner merchants that offer you a high cashback rewards rate on the first purchase you make at the merchant using a Bank of America card. You have to select the deals you want to load on your cards, but there is no limit to the number of selected deals, and of course there’s no reason to not select them all. The deals are effective on all your BofA cards; however, the deals are good for first purchases at the stores only. Once you make the first purchase through any card, you’ll get the reward, and the deal will disappear from your deals list. Each deal is valid for a certain period, usually 30 days. After the deal is used or expires, it may come back from time to time. Some of the better offers I’ve seen include 10% on Sports Authority, 10% on Bartell Drugs, and 15% on FedEx. Add-It-Up is Bank of America’s online shopping portal which offers you cash back every time you make online purchases through it. Suppose I’m going to buy a Lenovo laptop, and Add-It-Up is offering 5% cash back on Lenovo.com. When I click on Lenovo’s icon, the website will take me to Lenovo.com. During the same web session, I make a purchase of $1,000 on Lenovo.com. Then after a few days $50 will post on my Add-It-Up account, and I’ll be able to deposit this $50 into my bank account by the end of the month. 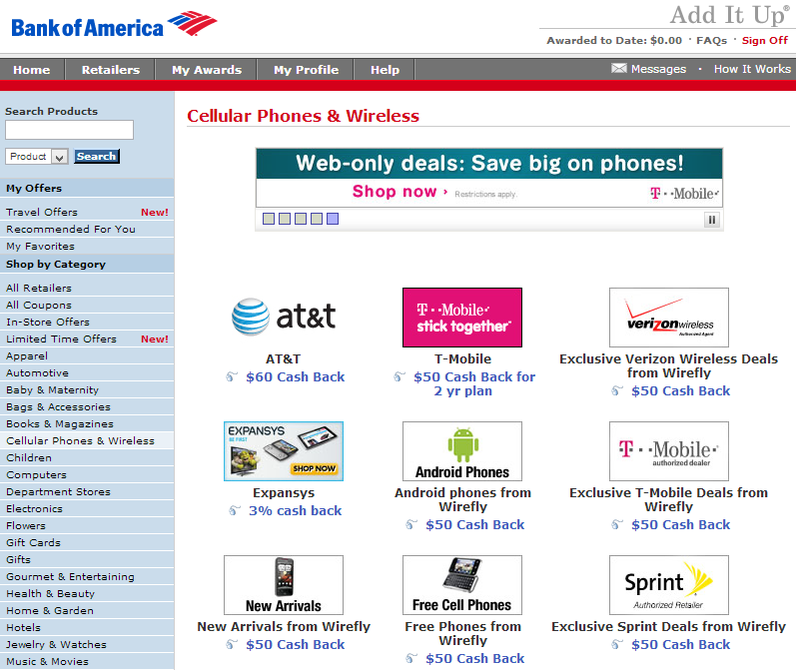 Some other banks have their own shopping portals as well, and there are websites designed to be shopping portals, and compared to all, Bank of America’s cashback earning rate is rather mediocre. And you’d have to accumulate at least $5 for your cashback credit to be paid out. On the other hand the range of merchants is quite good, and the processing time is relatively short: some websites only pay out cashback once every quarter. I have tried to cover most of the essential information about BofA’s credit cards in this post, so that you’ll know what to expect before you apply for one, or how to get the most out of it if you already have one. Let me know if you have any questions about Bank of America’s credit cards. I personally have found it helpful to have access to insider information for any endeavors.